MONTREAL QC--(Marketwired - Dec 13, 2016) - It is definitely the Most Wonderful Time of The Year as Ritz-Carlton Montreal gears up for their annual holiday launch with Montreal's social scene Sunday, December 11th with the help of some of the incredible kids from the Ste. Justine Children's Hospital UHC Foundation. 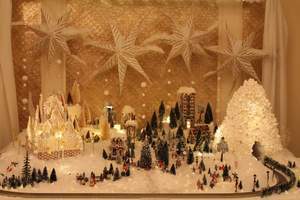 This year, local artisans joined forces to create a magical, edible 10ft x 10ft village with all the trimmings including an electric train that will make its way through the white meringue mountains and gingerbread houses right into our majestic Palm Court! Children will decorate cookies as media and their families enjoy an afternoon of caroling with local starlet Shaharah and a visit from Santa Claus courtesy of Infiniti Canada! Holiday village and design was conceptualized by Nicolina Servello and stylist Maude St. Pierre. Prop styling was courtesy of Pierce Atkinson and the edible treats were created by Pastry Chef Cindy Wollenschlaeger of Darling Delights. The Ritz-Carlton Montreal has been at the social heart of the city since 1912, when it opened its doors as the first hotel in the world to bear the name Ritz-Carlton. Since then, it has been the most elegant address in the city, conveniently located in the Golden Square Mile near to Montreal's high end boutiques, galleries and museums. For more information or to book visit www.ritzcarlton.com/montreal or call Reservations Toll-Free at 1-800-363-0366. Granted the prestigious CAA/AAA Five Diamond Award -- the only one in Quebec -- the Ritz-Carlton Montreal has been the most elegant address in the city since 1912. In May of 2012, the hotel re-opened after an extensive multi-year restoration, which saw the Montreal landmark transformed into a chic and modern space. The first hotel in the world to combine the Ritz and Carlton designations, the Ritz-Carlton Montreal is located in the heart of Golden Square Mile, home to Montreal's elite in the early twentieth century. A symbol of refinement and elegance, the hotel has welcomed some of the world's best-known heads of state, artists and business magnates. Several of the 20th century's leading figures have stayed there, including the Queen Mother, Winston Churchill, Charles de Gaulle, Richard Nixon, Pierre Elliott Trudeau, Brian Mulroney, George Bush Sr., as well as Elizabeth Taylor and Richard Burton, who celebrated their first wedding at the hotel. The Ritz-Carlton Hotel Company, L.L.C., of Chevy Chase, MD., currently operates more than 90 hotels in over 30 countries and territories. More than 40 hotel and residential projects are under development around the globe. For more information or reservations, visit the company web site at www.ritzcarlton.com, for the latest company updates, visit news.ritzcarlton.com and to join the live conversation, use #RCMemories. The Ritz-Carlton Hotel Company, L.L.C. is a wholly-owned subsidiary of Marriott International, Inc. (NASDAQ: MAR). It is definitely the Most Wonderful Time of The Year as Ritz-Carlton Montreal gears up for their annual holiday launch with Montreal's social scene. Discover holiday elegance at the Ritz-Carlton. Explore our luxury getaway packages at the Ritz-Carlton Montreal.